Benchmark Mineral Intelligence expects cobalt demand to increase four-fold, rising to 219,679 tonnes by 2023 and 276,401 tonnes by 2028. “What is key to understand is that less than 5 percent of total supply is affected by this. It is, however, a major social responsibility issue for electric vehicle and battery makers to manage,” Moores explained. Currently there is no large-scale output coming from other countries, but new resources could be developed, in particular in the US, which at present has little control over the cobalt supply chain. “Regions such as the Idaho-cobalt belt, which is globally known as being a cobalt rich jurisdiction, presents one of the few opportunities for US cobalt supply security,” Moores told the US Senate. First Cobalt (TSXV:FCC), which owns the Iron Creek project, eCobalt Solutions (TSX:ECS), which holds the ICP project, and International Cobalt (CSE:CO), which owns Blackbird Creek property, are examples of companies developing assets in that region. 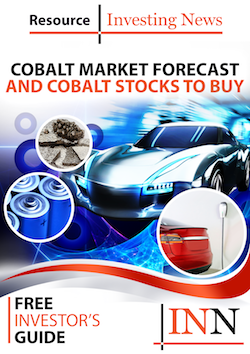 Editorial Disclosure: First Cobalt, eCobalt Solutions and International Cobalt are clients of the Investing News Network. This article is not paid-for content.